A new generation of Windows tablets has arrived with the launch of the Microsoft Surface 2, their second generation tablet, and the Nokia Lumia 2520, Nokia's first ever tablet. With virtually identical functionality and OS software, it is the quality and performance of their displays that really differentiates the tablets. Microsoft's original Surface RT launched in October 2012 had a display similar to the older Apple iPad 2, with a resolution of 1366x768 pixels and a small Color Gamut with just 57% of the Standard Gamut needed for accurate color reproduction. That was a notch down from Apple's existing iPad 3, with a much higher 2048x1536 resolution, a much higher almost perfect 99% full Color Gamut, and an excellent calibration that produced sharp, accurate, and beautiful image and picture quality. The new Surface 2 has moved up to a Full HD 1920x1080 resolution, which guarantees sharp images—but what else (if anything) has been improved? The Lumia 2520 also has a similar 1920x1080 full HD display that is 10.1 inches, half an inch smaller than the Surface 2. However, just like their Smartphones, Nokia is emphasizing the display's performance in high ambient light with "Enhanced outdoor readability," most likely indicating a very bright and low reflectance screen. This could a significant development because most existing tablets suffer from mediocre degraded performance in ambient light, an issue that we will analyze below. 1) Picture quality as good or better than your HDTV (to entice you to watch downloaded TV and movie content). 2) Excellent true color accuracy and accurate image contrast for high fidelity photos and images for all content. 3) Improved screen performance in high ambient light since Tablets aren't used in the dark. We'll cover these issues and much more, with in-depth comprehensive display tests, measurements and analysis that you will find nowhere else. To examine the display performance of the Microsoft Surface 2 and the Nokia Lumia 2520 we ran our in-depth series of Mobile Display Technology Shoot-Out Lab tests. We take display quality very seriously and provide in-depth objective analysis and side-by-side comparisons based on detailed laboratory measurements and extensive viewing tests with both test patterns and test images. To see how far mobile displays have progressed in just three years see our 2010 Smartphone Display Shoot-Out and 2011 Tablet Display Shoot-Out, and for a real history lesson see our original 2006 Smartphone Display Shoot-Out. In this Results section we provide Highlights of the comprehensive Lab measurements and extensive side-by-side visual comparisons using test photos, test images and test patterns that are presented below.Comparison Table section summarizes the Lab measurements in the following categories: Screen Reflections, Brightness and Contrast, Colors and Intensities, Viewing Angles, Display White Spectrum, Display Power Consumption. You can also skip the Highlights and go directly to the conclusions. For additional background and information see our 2013 Flagship tablet Display Shoot-Out, the 2012 Mini tablet Display Shoot-Out, our SID Tablet Display Technology Shoot-Out, and the original 2012 Microsoft Surface RT Display Shoot-Out. The Surface 2 is Microsoft's second generation Windows tablet. The new high resolution 1920x1080 full HD display delivers sharp text and graphics, particularly with Microsoft's ClearType sub-pixel Rendering, which provides enhanced sharpness for black and white text and graphics. This is especially important for the core suite of Microsoft Office applications. Unfortunately, that's about it for improvements in the Surface 2 display. In fact, many of primary display specs are now 5 to 10 percent worse than the first generation2012 Surface RT that we tested, including Brightness, Contrast Ratio, Contrast Rating for High Ambient Light, Specular Reflectance, and White Point. The Color Gamut has improved from 57 to 63 percent. But shockingly, aside from the increased resolution, the display remains comparable to the 2½ year old iPad 2 instead of the latest generation of Full Size Apple and Android Tablets that we recently tested. In fact, the Surface 2 display performs almost exactly like a larger version of the recently introduced iPad mini Retina Display that we recently cited for exactly the same outdated display. More on these issues below. The Lumia 2520 is Nokia's first tablet. It also has a 1920x1080 Full HD display with ClearType Sub-Pixel Rendering that delivers sharp text and graphics like the Surface 2. But Nokia has in addition pushed their display into record territory by producing the brightest mobile display we have ever tested with an incredible maximum brightness of 684 cd/m2 (sometimes called nits). That takes impressive thermal and power management. It is 74 percent brighter than the Surface 2 with a maximum 394 cd/m2 and 52 percent brighter than the iPad Air with a maximum 449 cd/m2. Together with its very low screen Reflectance the Lumia 2520 has by far the best high ambient light screen performance and readability of any tablet display that we have ever tested. The Lumia 2520 has a 75 percent Color Gamut, which is 20 percent larger than the Surface 2, but 25 percent below the 100 percent Color Gamuts on many of the latest tablets. The smaller Color Gamut is (at least in part) the result of compromises needed to deliver very high brightness. But all of the Color Gamut values are determined in absolute darkness 0 lux, while tablets are typically used anywhere from moderate indoor up through very high outdoor ambient light. levels. As we'll see below, the Lumia's actual visual Color Gamut rapidly improves compared to other tablets under real ambient lighting conditions until it exceeds their performance due to its very high maximum brightness and low reflectance. It's an impressive display delivering impressive performance in real world ambient light. More on these issues below. Both Tablets have full high definition 1920x1080 displays, with the same number of pixels as your 50 inch HDTV, but on a 10 inch screen, which is certainly impressive. With 208 to 218 pixels per inch screens, for 20/20 Vision the pixels are not resolved for viewing distances of 16 inches or more, which is a bit larger than typical viewing distances that may extend down to 13 inches. In practice that is perfectly fine for everyone, even for those of you with better than 20/20 vision. The reason is that pixelation and sharpness are very important primarily just for computer generated text and graphics because of their precise pixel arrangements, while photographic images are inherently fuzzy because their image detail is spread over multiple pixels. Windows displays have ClearType, which is Microsoft's implementation of Sub-Pixel Rendering, where the individual red, green and blue Sub-Pixels are treated as independent addressable image elements and are not all bound together into specific pixels. In some cases, particularly for black and white text and graphics, Sub-Pixel Rendering can make the screen appear to have up to 3 times the resolution of Pixel Rendering. As a result, these Windows tablets have displays that appear perfectly sharp. Because tablets are frequently used under a very wide range of ambient lighting, a display that can deliver very high Maximum Brightness is extremely important and a major advantage because not only does that improve the screen's readability, but also the image contrast, image colors and color saturation, and overall image and picture quality that you'll see under your actual real viewing conditions, both indoors and outdoors. The display on the Nokia Lumia 2520 provides record high ambient light performance and screen readability, with by far the brightest mobile display we have ever tested with an incredible maximum brightness of 684 cd/m2 (sometimes called nits). It is 74 percent brighter than the Surface 2 with 394 cd/m2 and 52 percent brighter than the iPad Air with 449 cd/m2. Note that it is important to appropriately adjust the display brightness in order to preserve battery power and running time, and also to reduce eye strain from looking at too bright a display. See the Brightness and Contrast section for details. The Color Gamut is the range of colors that a display can produce. In order to show accurate on-screen colors the display must match the Standard sRGB/Rec.709 Color Gamut that is used to produce virtually all consumer content. Note that consumer content does not include colors outside of the Standard Gamut, so a display with a wider Color Gamut cannot show colors that aren't in the original and will only produce inaccurate exaggerated on-screen colors—so in this instance, bigger than 100 percent is not better. The measured Color Gamuts for these tablets are shown in Figure 1. The Lumia 2520 has a 75 percent Color Gamut, which is 20 percent larger than the Surface 2, but 25 percent below the 100 percent Color Gamuts on many of the latest Tablets. The differences between all of these were quite noticeable in the Viewing Tests described below. However, it is important to note that the Color Gamuts are determined in absolute darkness 0f lux and change significantly even in low levels of ambient lighting. As a result of its very high Brightness, the relative Color Gamut of the Lumia 2520 improves significantly in ambient light compared to other tablets, which we discuss next. Compare the Color Gamuts in Figure 1 and in the Colors and Intensities section. The screens on almost all tablets and smartphones are mirrors good enough to use for personal grooming. Even in moderate ambient lighting the sharpness and colors can noticeably degrade from light reflected by the screen, especially objects like your face and any bright lighting behind you. Screen Reflectance has been steadily decreasing. Both the Surface 2 and Lumia 2520 have low Reflectance under 6 percent, which is excellent. Tablets are almost never used in the dark. The display's performance in ambient lighting depends on a combination of both its Maximum Brightness and the screen Reflectance, called the Contrast Rating for High Ambient Light (see below for details). The higher the measured Contrast Rating for High Ambient Light for a display, the better the image contrast, image colors, screen readability, and overall image and picture quality that you'll see under ambient light viewing conditions, both indoors and outdoors. The Lumia 2520 has a Contrast Rating for High Ambient Light of 120, by far the largest we have ever measured for a tablet. The Surface 2 has a much lower value of 67, so its high ambient light performance will be significantly poorer. While the Lumia's Color Gamut is 25 percent smaller than many multimedia tablets, that only applies in the dark. At 1,000 lux, which corresponds to bright indoor lighting, the Gamut difference decreases to just 9 percent with the iPad Air. But more impressive is that the Lumia's Contrast Ratio at 1,000 lux is already 78 percent larger than the iPad's. At 2,000 lux, which corresponds to low level outdoor lighting, the Lumia's Color Gamut is larger than the iPad's and then keeps getting comparatively better as the ambient light level increases. The effect of ambient light is much greater on the Surface 2 due to its much lower Brightness and Contrast Rating for High Ambient Light. At 2,000 lux the Lumia's Color Gamut is 56 percent larger than the Surface 2 and its Contrast Ratio is 81 percent larger than the Surface 2, and the disparity keeps increasing with ambient light level. To learn more see this article on display performance in ambient light. This article has screen shots that show how screen images degrade from reflections in bright ambient light. See the Screen Reflections section for details. While tablets are primarily single viewer devices, the variation in display performance with viewing angle is still very important because single viewers frequently hold the display at a variety of viewing angles, plus they are large enough for sharing the screen with others. Both tablets have displays with high performance IPS (or equivalent) LCD technology, so they were expected to show very little color shift with viewing angle, and our Lab measurements confirmed their excellent Viewing Angle performance, with no visually noticeable color shifts. However, all LCDs, do have a strong decrease in brightness (Luminance) with Viewing Angle, and both displays showed, as expected, more than a 50 percent decrease in brightness at a modest 30 degree Viewing Angle. See the Viewing Angles section for details. Getting very accurate screen image colors is very important and also very difficult because the display and calibration all need to be done extremely well at the factory. We have performed a set of detailed lab spectroradiometer measurements of the Tablet displays to see how accurately they reproduce a set of 21 Reference Colors within the Standard sRGB/Rec.709 Color Gamut. The Reference Colors and the colors actually reproduced by the Windows tablets are shown in Figure 2. The Color Accuracy Errors are examined in terms of JNCD (Just Noticeable Color Difference). As a result of the 63 percent Color Gamut for the Surface 2 and 75 percent Color Gamut for the Lumia 2520 the Color Errors are much larger than for displays with 100 percent Gamuts. Again, it is important to note that these results are for absolute darkness at 0 lux, and become worse (to varying degrees) for all displays with increasing ambient light. See Figure 2 for a discussion of JNCD with plots of the Reference Colors and the actually reproduced colors, and the Colors and Intensities section for the numerical results. The smaller Color Gamuts on both the Surface 2 and Lumia 2520 were quite noticeable in the Viewing Tests, which consisted side-by-side comparisons of a large selection of challenging photos with a calibrated display that has essentially perfect Absolute Color Accuracy and Image Contrast. Colors on the Surface 2 appeared particularly subdued, significantly more than on the Lumia 2520 as expected from the measured Color Gamuts. Greens were particularly vibrant on the Lumia and noticeable washed out on the Surface 2. The reds in fire engines, tomatoes, and even on a coke can appeared somewhat orange rather than a deep red, more so on the Surface 2 than on the Lumia 2520, which was noticeably better. See Figure 1 and Figure 2 and the Colors and Intensities section for quantitative details. Tablets are almost never used in the dark. Their screens reflect ambient light that washes out the colors and image contrast, and makes it harder to read the screen, especially with (specular) mirror reflections. These are significant effects indoors as well as outdoors. To see by how much, turn off the display but hold the tablet as if you're using it and then walk around your normal environment, both indoors and outdoors and see everything that it reflects. The higher the measured Contrast Rating for High Ambient Light for a display, the better the image contrast, image colors, screen readability, and overall image and picture quality that you'll see under your actual real viewing conditions, both indoors and outdoors. The display on the Nokia Lumia 2520 provides record high ambient light performance and screen readability, with by far the brightest mobile display we have ever tested with an incredible maximum brightness of 684 cd/m2 (sometimes called nits). It is 74 percent brighter than the Surface 2 with 394 cd/m2 and 52 percent brighter than the iPad Air with 449 cd/m2. Together with its low 5.7 percent screen Reflectance it has a Contrast Rating for High Ambient Light of 120, by far the largest we have ever measured for a tablet. While the Lumia's Color Gamut is 25 percent smaller than many multimedia tablets, that only applies in the dark. At 1,000 lux, which corresponds to bright indoor lighting, the Gamut difference decreases to just 9 percent with the iPad Air. But more impressive is that the Lumia's Contrast Ratio at 1,000 lux is already 78 percent larger than the iPad's. At 2,000 lux, which corresponds to low level outdoor lighting, the Lumia's Color Gamut is larger than the iPad's and then keeps getting comparatively better as the ambient light increases. To learn more see this article on display performance in ambient light. The display on the Microsoft Surface 2 delivers excellent performance for text based applications like Microsoft Office. But other than its higher screen resolution, the Surface 2 display is actually somewhat worse than last year's original Surface RT that we tested, with many of the primary display specs now 5 to 10 percent worse. Its Color Gamut is just 63 percent of the Standard Gamut, which results in noticeably bland and mediocre multimedia colors and picture quality. Its Maximum Brightness of 394 cd/m2 and Contrast Rating for High Ambient Light of 67 are also middle of the road, resulting in mediocre performance in Ambient Light. Other than its higher resolution, the Surface 2 is comparable to the 2½ year old iPad 2 instead of the latest generation of Full Size Apple and Android tablets that we recently tested. With virtually identical functionality and OS software, it is the quality and performance of the displays that really differentiates these Windows tablets. 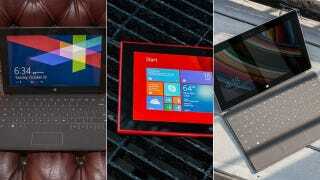 The display on the Nokia Lumia 2520 is impressive while the Microsoft Surface 2 is mediocre and a disappointment. There is still tremendous room for improvement and innovation in display technology, which I have covered in recent articles on super high density 440+ PPI displays, Curved and Flexible Displays, OLED mobile displays and OLED TV displays, plus a new technology called Quantum Dots will play a very important critical role for LCDs. The most important developments for the upcoming generations of mobile displays will come from improvements in their image and picture quality in ambient light, which washes out screen images, resulting in reduced readability, image contrast, and color saturation and accuracy. The key will be in dynamically changing the display's color management and intensity scales in order to automatically compensate for reflected glare and image wash out from ambient light. See this article on display performance in ambient light. The displays and technologies that succeed in implementing this new strategy will take the lead in the next generations of mobile displays. Below we compare the displays on the Microsoft Surface 2 and the Nokia Lumia 2520 based on objective lab measurement data and criteria. For additional background and information see our 2013 Flagship Tablet Display Shoot-Out, the 2013 Mini Tablet Display Shoot-Out, our SID Tablet Display Technology Shoot-Out, and the original 2012 Microsoft Surface RT Display Shoot-Out. Below is a partial excerpt of the table; you can see the full comparison at DisplayMate. This article has been republished with permission from DisplayMate.com, where it can be read in its entirety. DisplayMate Technologies specializes in proprietary sophisticated scientific display calibration and mathematical display optimization to deliver unsurpassed objective performance, picture quality and accuracy for all types of displays including video and computer monitors, projectors, HDTVs, mobile displays such as smartphones and tablets, and all display technologies including LCD, OLED, 3D, LED, LCoS, Plasma, DLP and CRT. This article is a lite version of our intensive scientific analysis of all types of displays – before the benefits of our advanced mathematical DisplayMate Display Optimization Technology, which can correct or improve many of the display deficiencies. We offer DisplayMate display calibration software for consumers and advanced DisplayMate display diagnostic and calibration software for technicians and test labs. For manufacturers we offer Consulting Services that include advanced Lab testing and evaluations, confidential Shoot-Outs with competing products, calibration and optimization for displays, cameras and their User Interface, plus on-site and factory visits. See our world renown Display Technology Shoot-Out public article series for an introduction and preview. DisplayMate's advanced scientific optimizations can make lower cost panels look as good or better than more expensive higher performance displays. For more information on our technology see the Summary description of our Adaptive Variable Metric Display Optimizer AVDO. If you are a display or product manufacturer and want to turn your display into a spectacular one to surpass your competition then Contact DisplayMate Technologies to learn more.